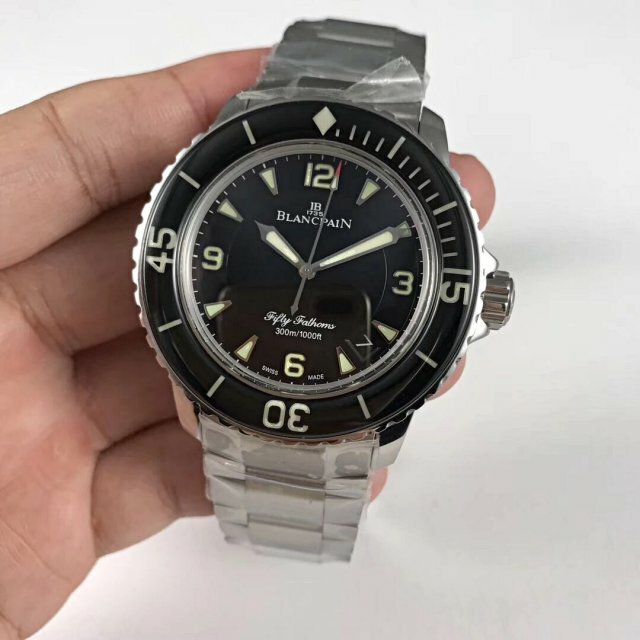 In our market, the only watch from Blancpain that could attract our attention is Fifty Fathoms. 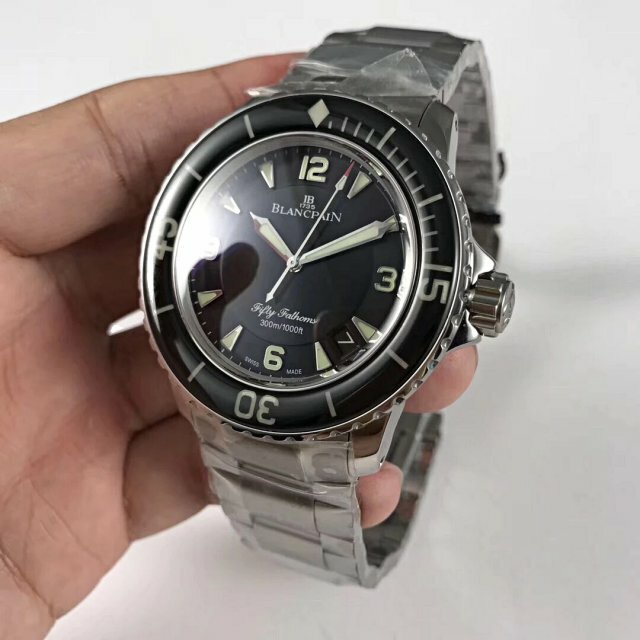 This diver’s watch has an old history. 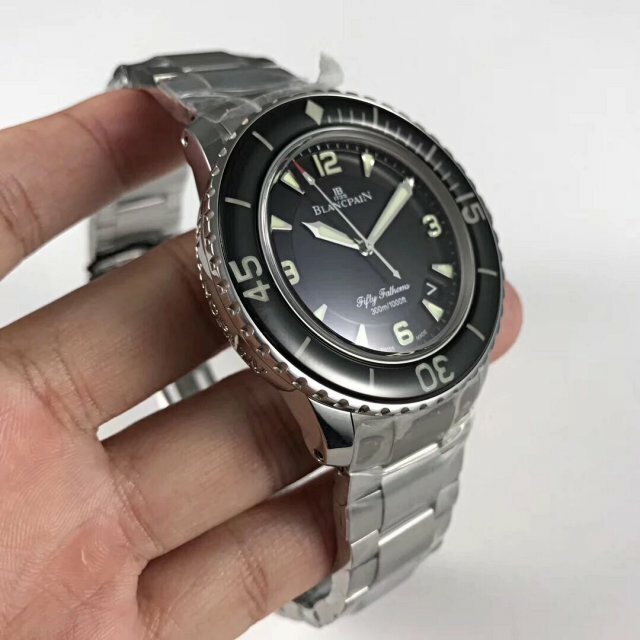 Both ZF and Noob make replica Blancpain Fifty Fathoms, several years ago, Noob unveiled the first Fifty Fathoms replica and the watch indeed made a hit in our industry. Since then, every factory has started to built their iconic model so that they can have a place in this field. 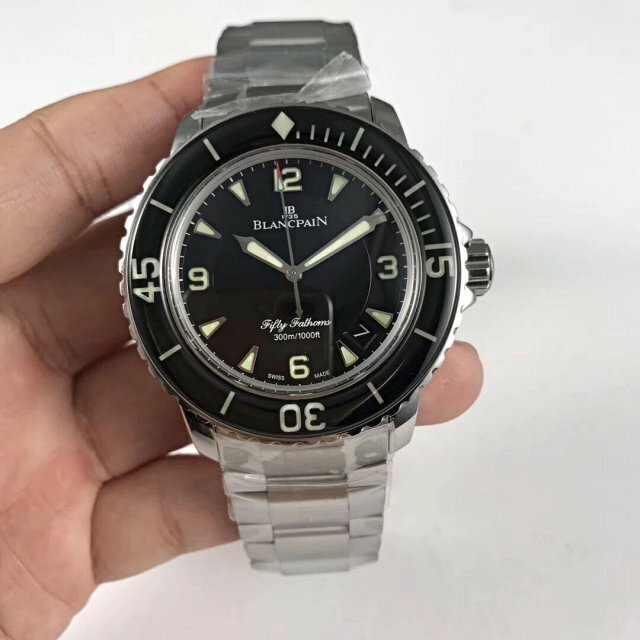 The release of Noob Blancpain Fifty Fathoms is just the start of glorious diving watches. 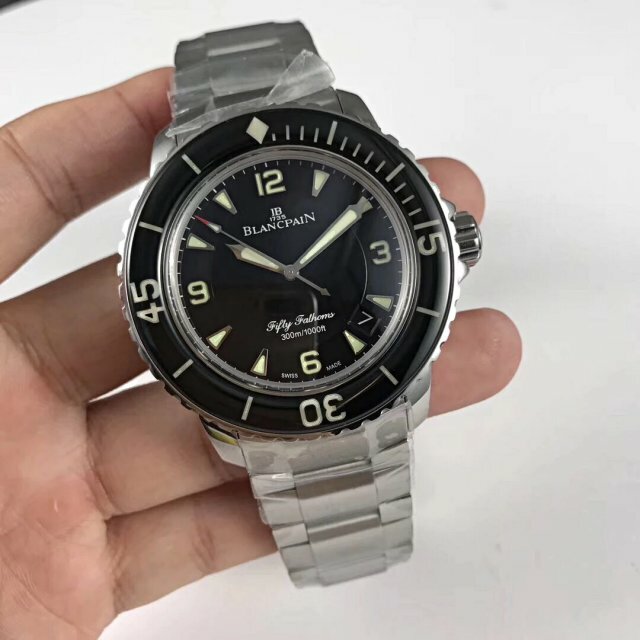 All Blancpain Fifty Fathoms watches made before were fitted with nylon band or leather band, now just in last week, this Blancpain Fifty Fathoms replica by ZF is firstly equipped with a stainless steel bracelet, so the watch feels much heavy than before. The watch has a case size of 45mm*15.5mm. It is made of 316L stainless steel and brushed. On case back, there are deep correct engravings. 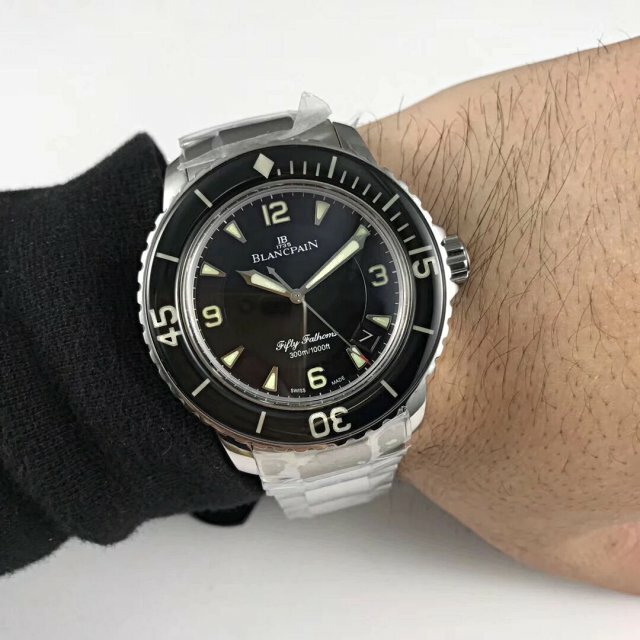 Like previous Fifth Fathoms, this one also uses domed sapphire crystal on bezel, there are superlumed markers under the scratch-resistant sapphire crystal. All bezel markers, including the digits 15, 30 and 45, are green superlumed in the dark. Black dial is covered by a sapphire crystal face. 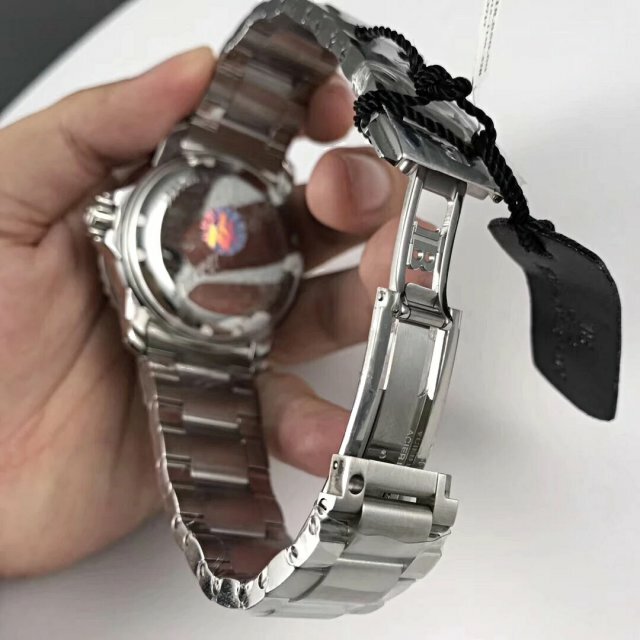 The dial has two layers like genuine watch. All printings are on the sunkened central dial, while all three-dimensional hour markers, including the Arabic numbers 3, 6, 9 and 12, are positioned on the outer circle. Like the bezel markers, hour markers and hands can emit a strong green lume light in the dark. To increase readability, Blancpain uses a red tip on the central second hand. ZF is the first factory that installed a full stainless steel bracelet on this replica watch. If you want one extra pair of nylon or leather straps, we can send one pair to you for free. Here I opened the case back and take a photo of the inside machine. Can not take a closer view because of my poor phone camera. 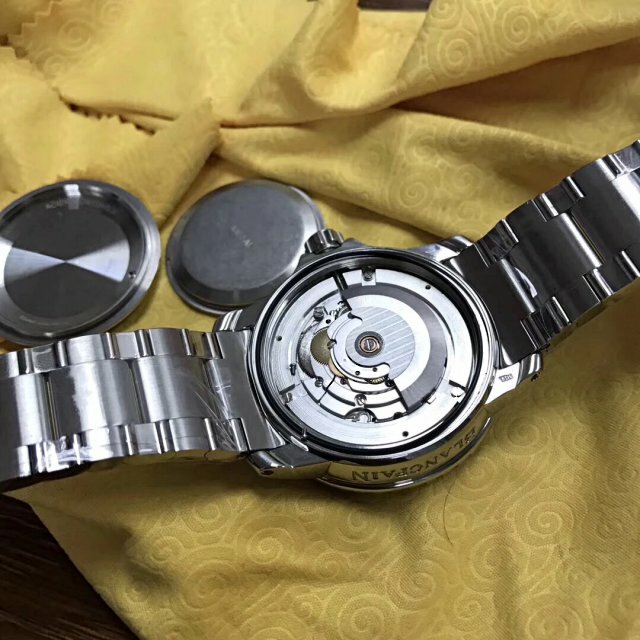 The movement inside is an Asia ETA 2836-2 automatic, a very reliable and accurate movement, this is the movement that is installed in the first bath of replica watches.